"Our mission, with this funny little film is to educate, activate and EMPOWER millions of voters around this country to put their bodies and hearts on the front lines of the election to protect their vote on November 4th." Part 2 of the Turdblossom lectures will address how easy it is to hack software driven voting systems. Myers told OpEdNews that Americans need to "take ownership" of our elections; we can't leave it up to insiders and expect things will get fixed. 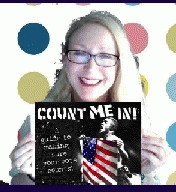 WUASYC also provides this free 17-page PDF, in color or in black and white, Count Me In: A guide to making sure your vote counts, featuring graffiti artist Banksy, and graphic artists Sophie Goldstein, Joy Cobler, and Beth Byrne. All the important ideas are mentioned: registration, absentee voting, parallel citizen polling, videoing the vote, and working as official pollworkers – in their creatively titled campaign "Give a Shift." One section deals with registration purging – where election officials send out mailers to registered voters to ascertain if the address is still good. If the non-forwardable card is returned to the Elections Board, political operatives use that list to challenge those voters should they show up on Election Day. Dozens of reports catalog this ongoing practice. Phone numbers, websites, citizen toolkits are all provided. Download it. Email the link to your friends, neighbors, coworkers and students. "Cheated!" illustrates "the story of the courageous citizens of Columbus, Ohio, who investigated and litigated against the massive voter suppression and fraud they experienced on Election Day, November 2, 2004." Back atcha, sister. My favorite pic from Cheated! is of Franklin County Board of Elections Director, Matt Damschroder. He floats like a dirigible as he waves goodbye to president [sic] Bush at Port Columbus International Airport. Reminded me of the pustulent corpulence in the original Dune film – Baron Von Harkonnen (Kenneth McMillan). Myers provides this detail into her research over the past two years. She explores the genesis of the vendor-protective Election Assistance Commission, created by hellish HAVA – the Help America Vote Act of 2002. Her research "eventually led to Texas in the 1980's, where a Plan was put into play to corrupt our election system and destroy our democracy. That's why we are in such danger this November. The Plan has come to fruition." "A core group from the Election Center seized control of the testing and certifying of the voting machines and spawned another private, "nonprofit" "nonpartisan" organization called NASED.... Under NASED, source code – the keys to the electronic kingdom - became proprietary. The secret vote-counting software now belonged to the voting machine vendors who would pay for the testing and certifying of their own software and hardware." It is true that all the major voting system vendors fight tooth and nail to keep their software and hardware a secret, to wit: Sequoia threatened to sue New Jersey if officials turned over their faulty machines to Princeton University for a careful review, after the machines reported totals that conflicted with their own internal memory during NJ's primary this year. Indeed, computer security experts have pointed out repeatedly that knowing the source code is no assurance of security or reliability. Software is undetectably mutable. There is no way to assure that the source code that is examined and certified is what is used on Election Day. Some key quotes can be found here. "Why do we have a badly broken election system in America? I'll bet that Rove and his operatives pushed for the passage of HAVA, in order to install unreliable, hackable voting machines across the country. And, once HAVA created the Election Assistance Commission, the same anti-democracy operatives packed the Advisory Board, the Voting Systems Standards Board and the four-person Commission." "Election officials across the country are routinely striking millions of voters from the rolls through a process that is shrouded in secrecy, prone to error, and vulnerable to manipulation.